Navigate to the Exhibitors tab inside your leads app management dashboard and click the button "+ Add Exhibitor"
2. 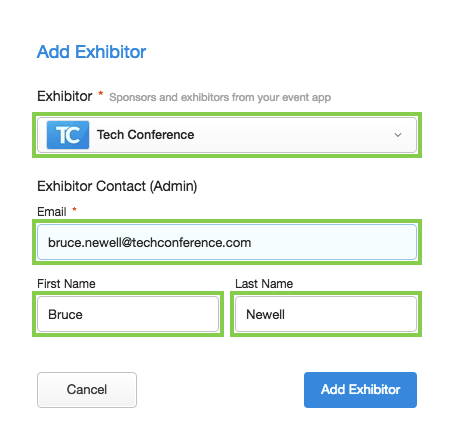 Select a sponsor/exhibitor you want to invite, enter their email, first and last name, then click "Add Exhibitor"
3. Now the invited exhibitor/sponsor will receive an email with the invitation which they will need to accept in order to access Lead Retrieval system. To invite other exhibitors, repeat the same process.